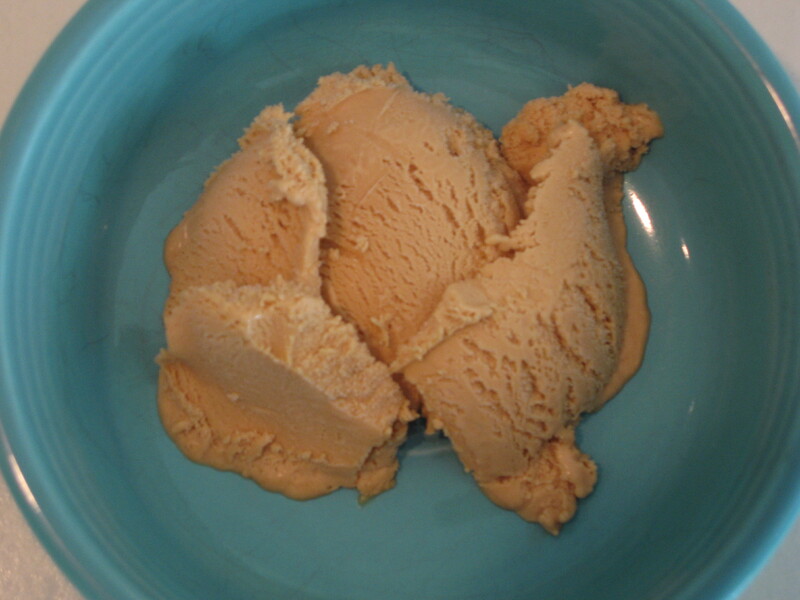 I have had Salted Caramel Ice Cream several times, and have always loved it, so I wanted to recreate it at home. So I went looking for a recipe. Jeni’s Ice Creams made in Columbus, OH makes a really good one and she has a cookbook that tells you how to make it. Perfect! I’ll do that one! But honestly it sounded too complicated to me. So I searched the Internet for a recipe. I found one on the Food Network website, but again, it looked really complicated. There was one on the Epicurious website that looked complicated too, but less so than all the others. It was the easiest I could find. Now normally I am an adventurous cook, and will try anything. In fact, I regularly make something for the first time when hosting guests. I usually have no fear when it comes to cooking. But this Salted Caramel Ice Cream seemed intimidating. You had to “melt” sugar, brown it, then pour cream into this melted sugar stuff with all the recipes warning “it will splatter”. I was nervous. I followed the Epicurious recipe exactly. Here is the link to the original, though I am going to re-quote it here to give you some tips. I hope Epicurous doesn’t think I am stealing their recipe. This was the step that seemed the most difficult to me. If you messed this up, the whole dish was ruined. So I did exactly what they said, almost. As the sugar began to melt (it actually melts! ), I kept stirring. What happens is that the molten sugar attaches to the fork, then cools and hardens, making clean-up a pain. So stop stirring when the sugar starts to melt. Also, this is like making a Roux. The longer you cook it, the darker (and more burnt tasting) it becomes. So I stopped when it was a “light” amber, knowing that it would cook a little longer off the heat. Add 1 1/4 cups cream (mixture will splatter) and cook, stirring, until all of the caramel has dissolved. Transfer to a bowl and stir in sea salt and vanilla. Cool to room temperature. They don’t lie, this splattered! And mixing the caramel and cream seemed like a forced marriage for the first few minutes, but it got easier and soon was a nice brown color. I used some Cyprus Flake Sea Salt since it was the “flakyest” I had on hand. I was tempted to put the mixture in the refrigerator to speed up the cooling process but resisted the urge. That worked, because the other stuff took a little time to make. This was straight forward, and a welcome easy step compared to the Caramel preparation. Lightly whisk eggs in a medium bowl, then add half of the hot milk mixture in a slow stream, whisking constantly. Pour back into saucepan and cook over medium heat, stirring constantly with a wooden spoon, until custard coats back of spoon and registers 170 degrees on an instant read thermometer (do not let boil). Pour custard through a fine-mesh sieve into a large bowl, then stir in cooled caramel. The first part was easy, but once I got the mixture back in the saucepan, it didn’t go as planned. First, I didn’t have a wooden spoon, just a plastic (heat resistant one), and it seemed that the mixture coated the back of the spoon upfront, so that was no help. After cooking for a short time, my thermometer read 150 degrees, but the mixture was bubbling like it was boiling, and getting thick. So I pulled the mixture off the heat. I used a big strainer to pour the mixture through and was surprised at the big chunks of stuff that were left, but what went into the bowl looked even better. I had to “mush” the mixture through the strainer at the end to get all of the liquid out. I put the custard into the refrigerator and stirred it every hour, and it stayed there for a good 6 hours. We have a 2 Quart Cuisinart Ice Cream maker, so I used that to churn the Ice Cream. It took about 25 minutes until the Ice Cream Maker was struggling and the mixture looked “firm”. I extracted the ice cream and put it into a plastic container and put it into the freezer overnight. We had some for lunch the next day, and WOW, it was outstanding! A wonderful toasty caramel flavor, with a slight salty flavor. But sweet and creamy too. I put some Marshmallow Cream on mine, but it didn’t really need anything. It was just so good by itself. So the ice cream was good, but even better was the lesson that a recipe that looks difficult might not be so hard after all. OK, no the ice cream was better than the life lesson….